We are Cyanoacrylate Adhesives Manufacturer & Cyanoacrylate Adhesives Supplier From Jaipur, Rajasthan. 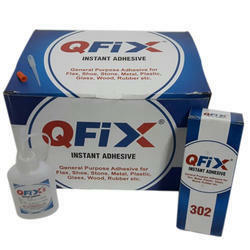 Our company has gained immense accolades in offering QFix Cyanoacrylate Adhesive to the clients. Offered range is manufactured with qualitative ingredients and checked by our quality controllers to ensure high adhesive strength. This product is thickened especially to meet the requirements for the bonding of porous substrates. Cyanoacrylate Adhesive is offered in various sizes and dimensions and can also be customised as per the needs of the client. This product is tested on numerous parameters to ensure zero defects. Our company has created a niche in offering Fevikwik Instant Adhesive to the clients. Offered range is made in different specifications to be in accordance with the large and small size of glue sticks. This product helps to fix or repair various items made from wood, stone, metal, glass, PU, vinyl and leather. Instant Glue is manufactured under the strict guidance of knowledgeable professionals using latest tools and techniques in accordance with market defined quality standards. This product is also examined on numerous parameters. 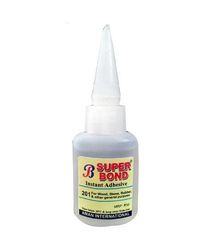 Our company has created a niche in offering Instant Glue Bond Adhesive to the clients. Offered range is made in different specifications to be in accordance with large and small sized of glue sticks. This product helps to fix or repair various items made from wood, stone, metal, glass, PU, vinyl and leather. Instant Glue is manufactured under the strict guidance of knowledgeable professionals using latest tools and techniques in accordance with market defined quality standards. This product is also examined on numerous parameters. 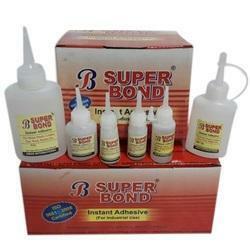 Our company has set a benchmark by offering Super Bond Instant Adhesive to the clients. This product is manufactured under the proper supervision of professionals by utilising high-grade raw material as per set industry standards. Offered range is checked on varied quality parameters so as to remove any kind of possible defect. This product is available in different specifications to meet our client’s diverse requirements. Our company has created a niche in offering Instant Glue to the clients. Offered range of Qfix Stone Adhesive is made in different specifications to be in accordance with large and small sized of glue sticks. This product helps to fix or repair various items made from wood, stone, metal, glass, PU, vinyl and leather. Instant Glue is manufactured under the strict guidance of knowledgeable professionals using latest tools and techniques in accordance with market defined quality standards. This product is also examined on numerous parameters. Our company has created a niche in offering Instant Glue to the clients. Offered range is made in different specifications to be in accordance with the large and small size of glue sticks. This product helps to fix or repair various items made from wood, stone, metal, glass, PU, vinyl and leather. Instant Glue is manufactured under the strict guidance of knowledgeable professionals using latest tools and techniques in accordance with market defined quality standards. This product is also examined on numerous parameters. 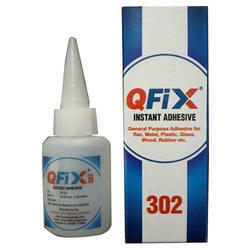 Our company has gained immense accolades in offering Cyanoacrylate Adhesive to the clients. Offered range QFix PVC Door Adhesive is manufactured with qualitative ingredients and checked by our quality controllers to ensure high adhesive strength. This product is thickened especially to meet the requirements for the bonding of porous substrates. Cyanoacrylate Adhesive is offered in various sizes and dimensions and can also be customised as per the needs of the client. This product is tested on numerous parameters to ensure zero defects. 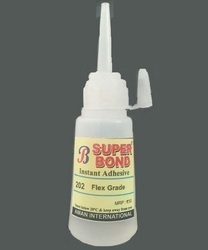 Our company has been acknowledged for offering Super Bond Flex Grade Adhesive to the clients. This product is used as an adhesive for a wide range of material or as a versatile filler for gap bonding, surface repairs and laminating. Offered range is also widely used electrics, electric equipment, doll, light, mould, metal, rubber, plastic, craft, gift, leather, wood. 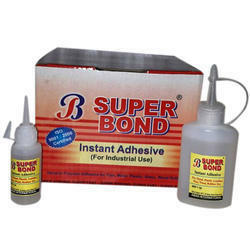 Our company has created a niche in offering Instant Glue Super Bond Flex Adhesive to the clients. Offered range is made in different specifications to be in accordance with the large and small size of glue sticks. This product helps to fix or repair various items made from wood, stone, metal, glass, PU, vinyl and leather. Instant Glue is manufactured under the strict guidance of knowledgeable professionals using latest tools and techniques in accordance with market defined quality standards. This product is also examined on numerous parameters. Our company has created a niche in offering Instant Glue to the clients. 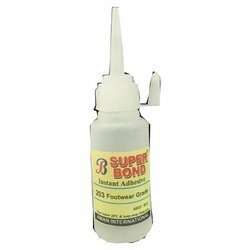 Offered range of Super Bond Wood Glue is made in different specifications to be in accordance with the large and small size of glue sticks. This product helps to fix or repair various items made from wood, stone, metal, glass, PU, vinyl and leather. Instant Glue is manufactured under the strict guidance of knowledgeable professionals using latest tools and techniques in accordance with market defined quality standards. This product is also examined on numerous parameters. Our company is highly esteemed firm known for offering Cyanoacrylate Adhesive Bulk Pack to the clients. This product is manufactured using qualitative material at our production unit under expert guidance and supervision. Offered range is widely used for packaging different pharmaceutical products and is available in different specifications as per the requirement specified by the clients. Cyanoacrylate Adhesive Bulk Pack is extensively used in coal, mining and many other industries. We are offering Acrylic Sign Board Adhesive, Acrylic sign board, Acrylic sign, Acrylic sheet to clients, with no whiteness, very high bond strength, all Sizes available. Our company has achieved widespread recognition for offering No White Instant Adhesive to the clients. Offered range is manufactured by making use of quality-approved material under the observation of highly experienced technocrats in accordance with market quality standards. This product is rigidly tested on various quality parameters to provide a defect free range in the market. No White Instant Adhesive is available in various technical specifications to meet the wide needs of the clients. No White Instant Adhesive is suitable for plaster, plasterboard and timber. No White Instant Adhesive to the clients. Offered range is manufactured by making use of quality-approved material under the observation of highly experienced technocrats in accordance with market quality standards. This product is rigidly tested on various quality parameters to provide a defect free range in the market. No White Instant Adhesive is available in various technical specifications to meet the wide needs of the clients. No White Instant Adhesive is suitable for plaster, plasterboard and timber. We are providing Flex Banner Adhesive of All Grades, sizes, bottles available, as per requirement. 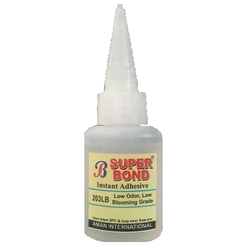 Our company has created niche in offering Super Bond Instant Glue to the clients. Offered range is made in different specifications to be in accordance with large and small sized of glue sticks. This product helps to fix or repair various items made from wood, stone, metal, glass, PU, vinyl and leather. Instant Glue is manufactured under the strict guidance of knowledgeable professionals using latest tools and techniques in accordance with market defined quality standards. This product is also examined on numerous parameters. 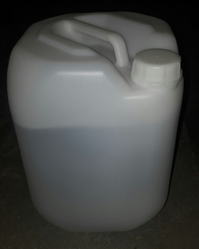 We are providing Flex Sign Board Adhesive of all Grades, packing bottles available, as per requirement. Looking for Cyanoacrylate Adhesives ?